Traffic can be led with more than signage alone. Artwork is used as a way-finding tool and should assist in the movement of people through interior and exterior spaces. Art images provide an immediate recognition to those under stress who may not have time to read a sign. Images can provide help to those who may not be able to read due to vision impairments or literacy barriers. ADA Accessibility Guidelines call for the removal of barriers to those with special needs. 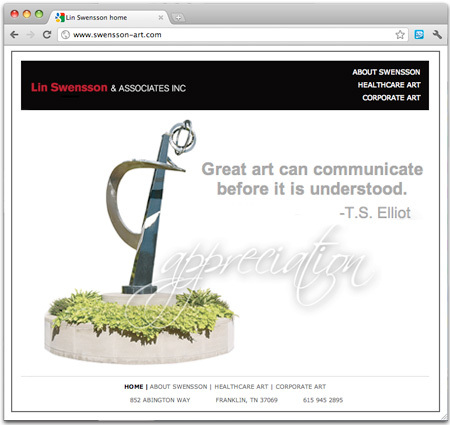 Lin Swensson, an art consultant, needed a presentation materials to convey her artistic experience and knowledge of the arts to potential clients. Ncutt created both a creative and professional presentation to speak to her corporate clientele. Ncutt assists Lin’s with her business proposals and collateral used on projects – all elements created have one voice and convey a consistent message. creative value: Wayfinding communicates direction.